The digital age has not only made it easier for musicians to be heard, but it is also allowing photographers to get their shots seen. No matter how much of a beginner or an amateur you are, the internet can most certainly turn your hobby into a promising career. Flickr, photo blogs, forums and social networks will give you opportunities to expose your work. When you start out in the business of music photography, you won”t yet be shooting for a publication. It”s wise to start by going to small venues where you won”t necessarily need press accreditation. Make the most out of these smaller gigs to become familiar with your camera in darker and unpredictable conditions. Remember, it”s not about who you get to shoot, but how you shoot them to make the smallest of musicians look like the greatest of rock stars. Specially at small venues, gigs tend to be dark so it is important to consider increasing the ISO when there is not enough light. However, to ensure the quality of the photography, the ISO value should always be as low as possible. The poor light conditions oblige professionals to work with wide aperture lenses. 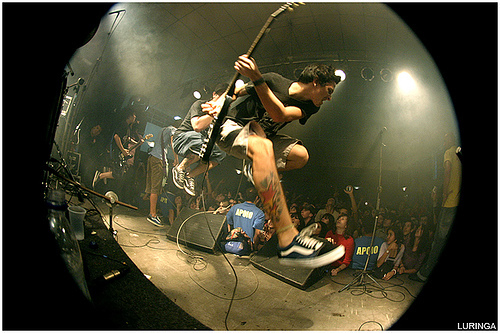 To get sharp shots of the most energetic musicians on stage, it is important to increase the shutter speed. You may need to crank up the sensitivity setting to avoid blurring, even if that means allowing for some noise in the picture. Finally, make sure you switch to aperture priority (A or Av) as this will enable you to set the widest aperture on the lens. Once you have acquired some experience, it”s time to prepare your portfolio with your very best shots. Start getting in touch with local music magazines and even online magazines. As small as these publications may be, they will grant you an important number of connections, and who knows, you may be pitching a fair amount of freelance assignments in no time. Check out this video by Adam Elmakias, a high-rated music and travel photographer from California. At Melboss, music photographers will be able to get in touch with each other and be found by musicians to cover their shows. Start networking in the music photography industry by requesting an invite here!